Definition of foreign exchange rate . In which rate a currency of a county is turned & converted into another is called foreign exchange rate. * Exchange rate is the exchange ratio of the currency of two countries. * A unit currency of a county will be turned into How many currencies of other countries is determined by the exchange rate. * Received-payment of currency depends on exchange rate. * Exchange rate is changed with the changing of economic condition of a country. 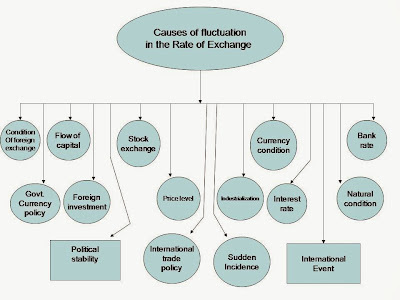 Causes of fluctuation in the rate of exchange. The ratio of turning the currency value between two countries is called the rate of exchange. The exchange rate of two countries is fluctuated due to the difference of demand & supply of more than one country's currencies. 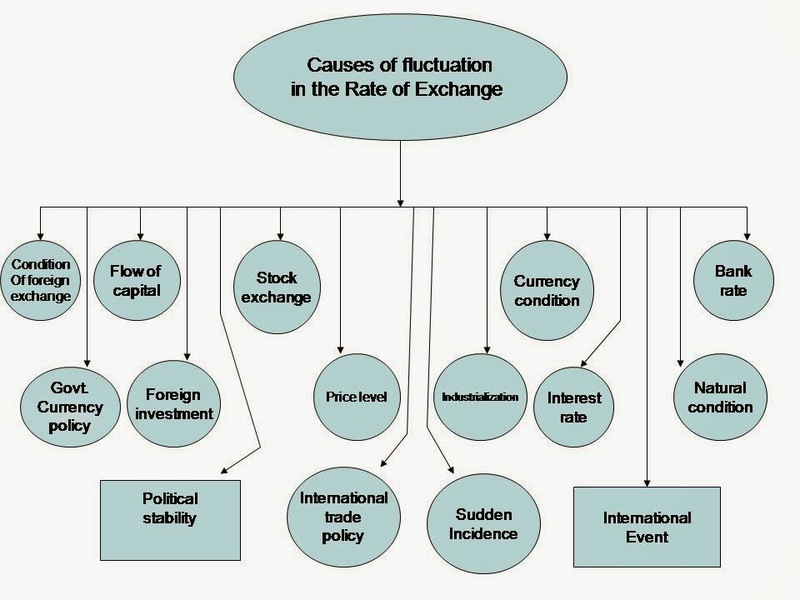 There are many causes of fluctuating the exchange rate which are given below with details. If export is increased then foreign trade becomes favourable, more foreign currencies come in country, exchange rate is climbed up and vice versa. If capital comes in county then more foreign currencies are entered & vice versa that means with the increasing -decreasing of flow of capital the rate of exchange is fluctuated. More translations & the attendance or foreign companies in share market create the enhancement of stock exchange and less of that create oppose of that, means if foreign & countries purchasers buy more share then more foreign currencies enter into market, bull position of share market is created, exchange rate is augmented and vice versa. If the inflation is run up then the currency value is lessen and if deflation is available then currency value & exchange rate is incremented. Thus, more inflation and deflation waste the balance of fluctuation of exchange rate. If the bank rate of a country is raised then more deposits to bank is accumulated, foreign trade becomes favorable, more foreign currencies come in county, the rate of exchange is enhanced. The countries currency value is fluctuated through currency policy. If the currency policy is favorable of country then increasing the country's currency value, the exchange rate is climbed up and opposite reaction is created in opposite situations of that. Foreign investment depends on investment policy & environment of a country. So, if the foreign investment is picked up then foreign currencies come into, exchange rate is elevated and vice versa. If the political condition of a country is stable then in a country the foreign investment is lift up, more foreign currencies come into, exchange rate is increased and in opposition the opposite reaction is exercised. When the price level in market is declined then the currency value is run up, exchange rate is lift up and vice versa. The value of currency is also climbed up due to industrialization and as a result being the favourable industrial environment of country, the supply of foreign currencies and exchange rate is incremented in a country. If the International trade policy come in a favorable position of country the foreign currencies are entered into. As a result the rate of exchange is elevated. In the increment of interest rate, huge foreign capital is invested due to more profit, exchange rate is also enhanced and vice Versa. At the stability of natural condition the industry, business & commerce of a country is developed, entrance of foreign currencies is occurred and as a result exchange rate is drawn up also. Any sudden incidence is occurred or happened in country or at international stage, then exchange rate is climbed up. If such incidence isn't happened then economic development & stability will be run up, income will be enhanced and exchange rate will be lifted up. If any International event goes on favorable position of a country then exchange rate is affixed and vice versa. At last it is said that, the exchange rate can be increased & and; decreased in various reasons. But speculative businesses of currency, conditions of commodities market, international politics, various economic causes etc except the above described facts can impact & fluctuate to the exchange rate or foreign exchange rate. Foreign Exchange Rates can be different according to the time. All these rates must be designed according to the new ideas of https://topamericanwriters.com/paperwritings-com-review work. I wish that i can share this blog on different sites.